Want cake? I always always want cake. I crave cake...and ice cream and cheesecake, and basically anything with sugar in it. The tastiest hummingbird cake! 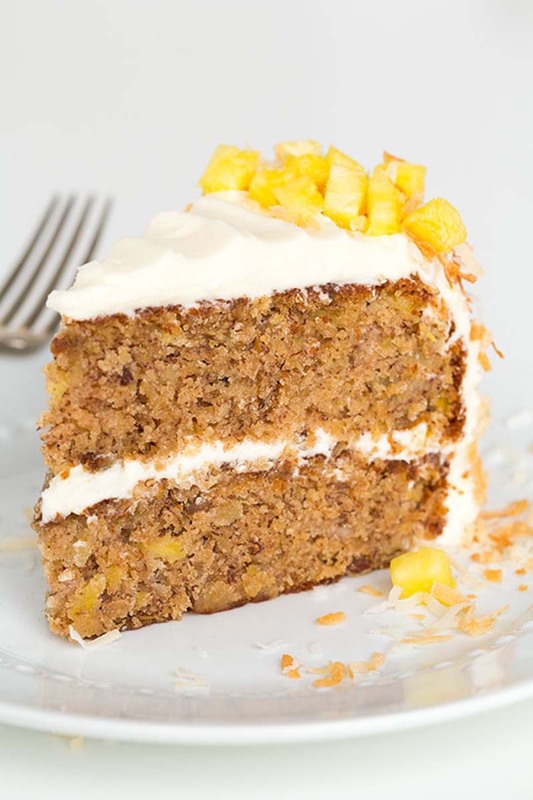 It's filled with pineapple, bananas, pecans and spices and it's finished with a rich cream cheese frosting. Preheat oven to 350 degrees. Butter 2 9-inch round cake pans and line bottoms with a round of parchment paper. Butter parchment paper and lightly dust pans with flour (shaking out excess). In a small mixing bowl, stir together finely chopped pineapple with 1/4 cup all-purpose flour, set aside. In a mixing bowl whisk together remaining 2 1/2 cups flour, the baking soda, cinnamon, nutmeg and salt for 30 seconds. In a separate large mixing bowl, using an electric hand mixer set on medium-high speed, whip together granulated sugar, brown sugar and eggs until pale and fluffy, about 3 - 4 minutes. Slowly blend in canola oil, then mix in vanilla extract. Add 1/2 of the flour mixture and using a rubber spatula, fold just until combined. Add mashed bananas and fold to combined, then add remaining flour mixture and fold until combined. Fold in pineapple mixture and chopped pecans. Divide batter evenly among prepared cake pans. Bake in preheated oven until toothpick inserted into center of cake comes out clean, about 38 - 42 minutes. Remove from oven and allow to cool in cake pans several minutes, then invert onto wire racks to cool competely. 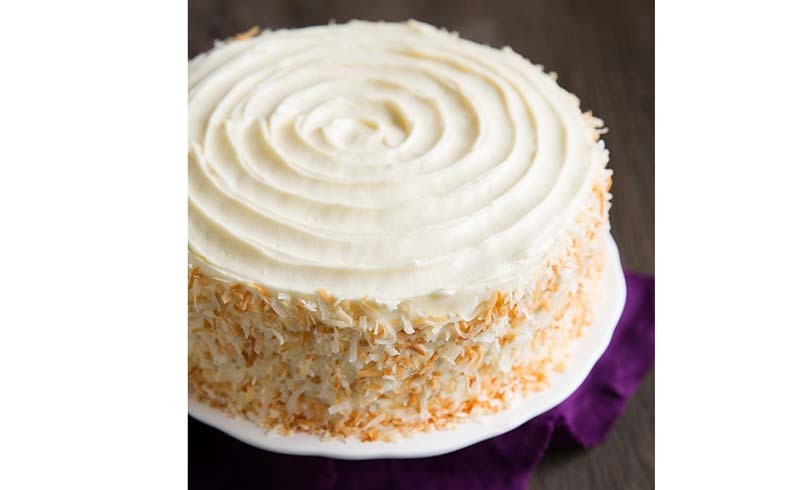 Frost with cream cheese frosting and gently press toasted coconut onto sides and sprinkle over top if desired. In the bowl of an electric stand mixer fitted with the paddle attachment, whip together cream cheese and butter until smooth and fluffy (scrape down sides and bottom of bowl occasionally throughout entire mixing process). Add powdered sugar and vanilla and blend again until smooth and fluffy. 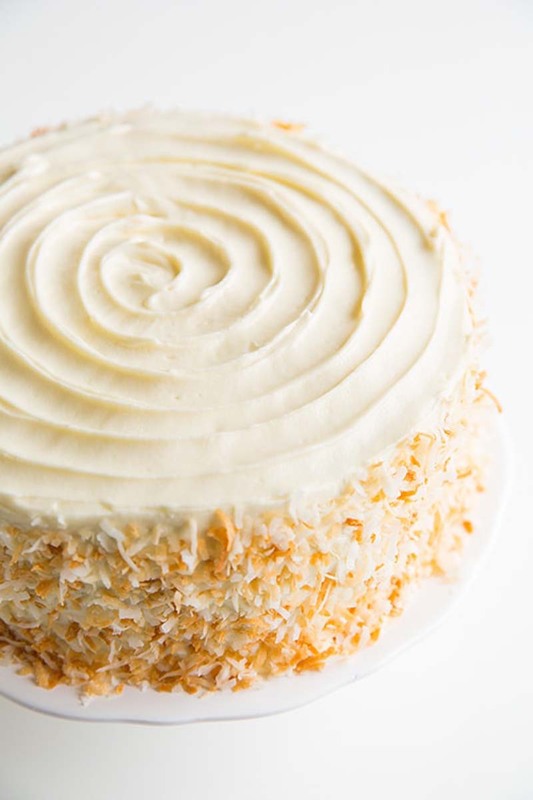 *If you just want to cover the sides with coconut you'll only need 1 cup, if you want to cover the top as well, do 2 cups.